Dan Webster is a licensed precious metals dealer. He buys gold, silver, platinum, jewelry, and coins at market prices. He also sells a wide variety of pre-owned gold, silver and platinum jewelry at prices much lower than you would find in a retail jewelry store. He enjoys the business and makes sure the experience is respectful for his customers. Webster bought Bow Creek Financial and Jewelry Outlet in December 2013 knowing full well that the public’s perception of buying and selling precious metals could be negative. He chalks it up to people not knowing what transpires behind the scenes when they show up with their items they want him to buy. A jewelry box tells a story of personal history and memorable events; there’s the emerald ring grandma got from her mother, as well as a pair of diamond earrings given to mark a milestone anniversary. Then there’s a 14-K gold necklace that only serves as a reminder of a relationship that ended on a sour note. Dig a little deeper and you’ll probably find out of date pieces such as gold earrings without mates and other pieces that are broken and can’t be repaired. You might even find a coin or two that you don’t want to keep. It’s these unwanted items that Webster will gladly accept and in return pay cash. “When customers come to me with jewelry or coins they want to sell, I make sure that they see every step in the process,” says Webster. The Bow Creek staff is expertly trained to test and weigh the precious metals to give our sellers the maximum amount possible. While the majority of Webster’s business is cash for gold and other precious metals, he also offers a large assortment of pre-owned gold, sterling silver or platinum jewelry. He says the pieces have been tested and verified. 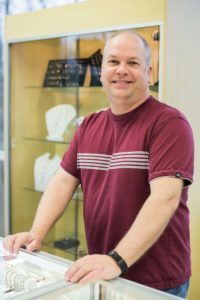 “My selection of quality, pre-owned and estate jewelry has been hand selected by my expert staff to ensure that you’ll find the perfect piece at a great price,” says Webster who also relies on his wife Shelley to help in the selection process. The Websters are parents of two daughters, Ashley age 17 years and Megan, 15 years. Webster’s selection of pre-owned jewelry include rings, bracelets, earrings, pendants and necklaces. 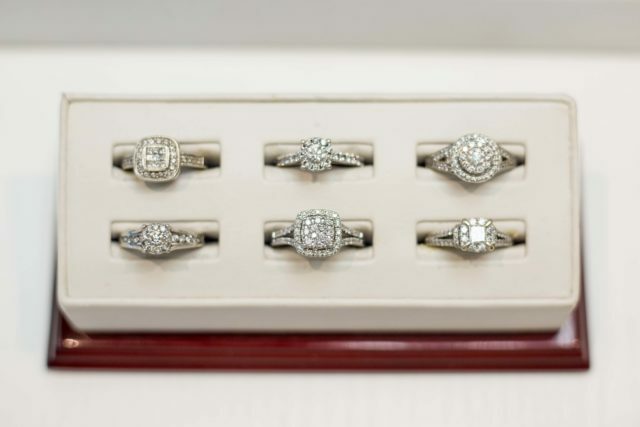 It also includes engagement rings in many styles and a variety of diamond sizes, as well as, wedding bands. “The markup in a retail jewelry store can be as much as 800 percent. I want folks to know if they’re looking for a piece of jewelry they need to check out my prices first,” says Webster. Bow Creek Financial and Jewelry Outlet is located at 545 Bow Creek Road, Grantville, across from Hollywood Casino.